Sometimes, though, an Event of Magnitude comes along and even my sacred reading order gets turned upside down. Yeah, I know, I've been hinting at some big news for weeks now. Well, today is the day, the curtain is up. With all the excitement surrounding the move, my usual reading list gets pretty much kicked aside and substituted with all sorts of Guides to Rural Pursuits. I'm a city girl, born and bred, and if my experiment is to work, I need to gather as much information as I can. Normally I would spare my readers any details of the countless how-tos I'm digging through, but sometimes I come across one that is actually worth mentioning. Like Michael Kelly's Tales From The Home Farm. A few years ago, Kelly did something similar to what I'm doing right now: he ditched a corporate job and relocated to the countryside, to live the dream. Some time into his adventure, he's far on the road to self-sufficiency. The Home Farm is producing meat, eggs and veggies straight from the garden. The author shares whatever he managed to learn on the journey - his tips on growing food in Irish climate, keeping chickens and turning pigs into pork are invaluable. The book is divided into twelve chapters, one for each month in a year. I find this arrangement incredibly helpful, especially with each section followed by a brief summary: what to do, what to sow, what to eat. I'll probably be photocopying those pages for future reference! Still, homesteading lore is only a half of Kelly's book. The rest is filled with musings on sustainability, organic food production and life in general. 'Tales', you see? This is not a guide or a textbook as such, it's farm-oriented storytelling. Good storytelling, I hasten to add: funny, warm, lighthearted, nothing sermon-like. It's obvious that downshifting has served Mr. Kelly well - passion and contentment shine through every page. To top it all off, Michael Kelly and I seem to share the same taste in books. 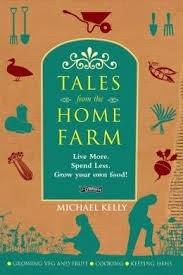 Quite a few titles mentioned in Tales From The Home Farm have been reviewed here, on Bookworm's Cave. How cool is that? The book is still worth recommending even if you're not planning to move away from the city lights, . A word of warning, though: after reading the tales, you might find that you want to!